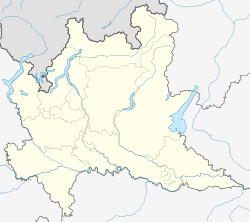 Locate Varesino (Comasco: Locàa [luˈkɑː]) is a comune (municipality) in the Province of Como in the Italian region Lombardy, located about 30 kilometres (19 mi) northwest of Milan and about 20 kilometres (12 mi) southwest of Como. As of 31 December 2015, it had a population of 4,349 and an area of 5.8 km². Locate Varesino borders the following municipalities: Cairate, Carbonate, Fagnano Olona, Gorla Maggiore, Tradate. This page was last edited on 31 August 2018, at 21:04 (UTC).